This dish presents beautifully at a dinner party, and the curried chickpeas are loaded with wonderful Indian flavor combinations. I like to serve this with warm naan bread fresh from the oven. Leaving eggplant whole, carefully slice the eggplant into 1/4 inch slices. Gently sprinkle a generous amount of salt between each layer & let rest at room temperature for 20-30 minutes. Preheat oven to 400 degrees. With a paper towel, gently pat each layer clean of the salt & oil the eggplant released. Lightly brush, or spray each eggplant with olive oil, making sure to get in between each layer. Sprinkle with salt and pepper, gently pull to slightly open up the eggplant, fanning the layers (you will do this again 1/2 way through roasting so do not force and break the eggplant apart). Place on a parchment paper lined baking sheet and roast for 25 minutes. After 25 minutes, remove the eggplant from the oven and gently and carefully press down on the eggplant using a spatula to fan further and separate the layers. Place back in oven and roast for 20 more minutes, or until very tender. Warm six tablespoons olive oil in a medium sauté pan over medium heat. Sauté onions, diced red peppers, garlic and a pinch of salt until garlic lightly browns, 6 minutes. Add vinegar and cook until evaporated, about 30 seconds. Add curry powder and chickpeas. Sauté until beans warm through. Off heat, stir in parsley, cilantro, and scallions. 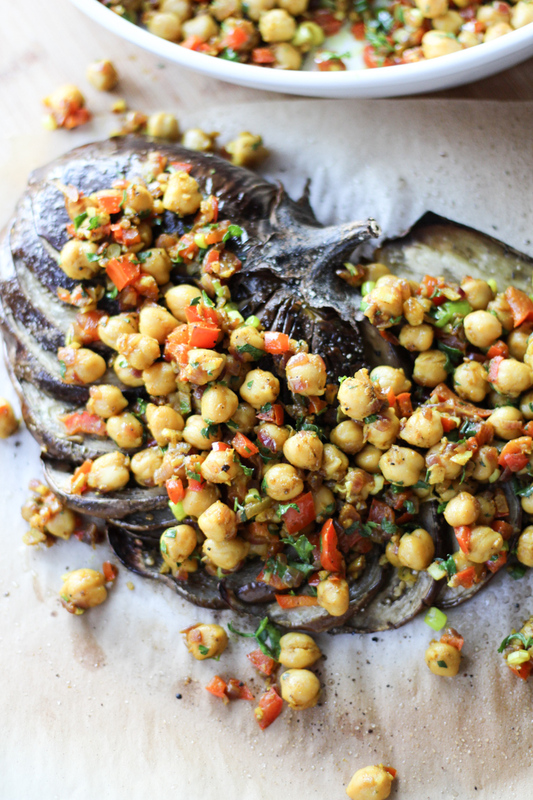 To serve, top each eggplant with curried chickpeas. Garnish with additional olive oil, herbs, and scallions. Serve with flatbread, rice or a salad.